→Types of Humidifiers and What Type of Humidifier Is Best For Baby? Whole ﻿H﻿ouse ﻿H﻿umidifier and ﻿W﻿hat ﻿I﻿s ﻿T﻿he ﻿B﻿est ﻿W﻿hole ﻿H﻿ouse Humidifier? What ﻿T﻿ype Of Humidifier Is Best For Allergies? Purchasing a humidifier for baby is highly recommended by pediatricians. It doesn’t only protect babies from illnesses but it also freshens the indoor air. Apart from the health benefits, this appliance is also beneficial in reducing static electricity, as well as peeling of wallpaper and cracks. Indoor humidity should be between 30% and 50%. Without a humidifier, it can drop to 10% in winter. The reason for this is that the winter season causes cold air resulting in less moisture. With the use of a heater, the air dries out which may cause several respiratory issues. Unfortunately, not all models on the market can perform at their best. Some of them would even soak you with additional costs. Thus, experts recommend putting substance over style. You should avoid purchasing a humidifier because of its overall appearance. It’s also not right to assume that the pricier the unit is, the better it is. There are several reasonably priced models that can humidify even a bigger house. It utilizes the same heating element to boil the water. Warm mist humidifies indoor air by releasing a warm steam. This is ideal if you’re living in a cold climate as it can make your baby’s room feel warmer. It has integrated ultraviolet antimicrobial features that can eliminate germs and spores in the water before it’s vaporized in the air. It operates quieter than a cool mist as it doesn’t use a fan. Rather, it uses a heating element that boils the water into a steam. All mineral contents present in the water are left behind in this appliance. Unfortunately, this type of humidifier consumes higher electricity and most models can only humidify air in small rooms. This type uses the principles of natural evaporation, which is considered to be the cleanest method of humidifying a room. There’s a wicking filter that sits in the unit’s base to absorb water. It adds moisture into the air by releasing the clean water in the filter. The filter traps any type of impurities present in the water to make sure that you’ll have cleaner air that’s free of minerals and impurities. It’s ideal for larger rooms. And if you’re short on budget, this type is the better option as most models are reasonably priced. Unlike the warm mist humidifier, this one utilizes low power. Among the many types of humidifier, this one is the quietest. Most ultrasonic humidifiers utilize demineralization cartridges to trap minerals in the water before they’re even released into the air. This type doesn’t only eliminate bacterial growth in the water and air but it also keeps your baby’s room from feeling too cold, during the winter season. This type can be easily purchased at drugstores. It’s budget-friendly and it uses electricity to heat water before expelling into the air. Oftentimes, this is used in one room. But this isn’t the best choice for nursery or in a room where children frequently stay as it can cause burns. Whole House Humidifier and What Is The Best Whole House Humidifier? Besides the nursery room, you may want to consider humidifying the whole house. If this is your goal, you should consider a central humidifier. It’s attached to your home’s air conditioning or heating system. Since its purpose is to humidify the whole house, this type of humidifier is the most expensive. However, it’s the best choice if you don’t want to purchase one unit for each room. What’s great about a whole house humidifier is that it can significantly reduce the risk of spreading flu virus. It eliminates possible white dust emission or other impurities from being introduced into the room air. For many experts, this is the most natural and the safest type of humidification. And it’s also the only type of humidifier that can cover larger areas. For allergy sufferers, a cool mist humidifier is ideal. However, it’s still a must that you keep the filters clean to avoid bacterial growth. You can find humidifier units that come with both cool mist and warm mist features. With these models, you can keep your room cooler during the summer season and keep it warmer in winter. 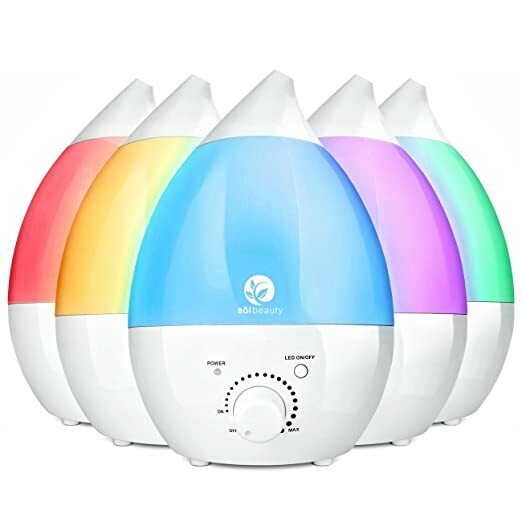 Your baby’s pediatrician may specifically recommend this type of humidifier as you can switch from one option to another to make sure that the nursery room’s humidity is at a recommended level. When using a warm mist humidifier, it’s a must that it’s installed in a place where children can’t reach it. It must also be away from any flammable materials. You shouldn’t place a warm mist humidifier on a carpet or any other upholstered surfaces. Regardless of the brand and model you choose, you should clean the unit regularly. In this way, you can avoid spreading bacteria and mold, which can surely aggravate allergies and asthma symptoms. It’s also ideal to choose a model that comes with a built-in antibacterial technology to keep the water clean. With this in mind, you don’t need to wash it frequently. Then, opt for a model that adjusts automatically based on the moisture level of the room. In this way, there’s no need for you to set the level each time the moisture level rises or decreases. It’s also essential to remember not to allow too much moisture in the room as it can create condensation on your home’s walls. And if it’s not alleviated immediately, the water can turn into molds, which can easily spread throughout your home. You should also clean it as often as necessary or as recommended by the manufacturer. Bear in mind that unclean units encourage the growth of bacteria, which can cause coughs and colds. It’s also important to wash the bucket and the unit’s filter system every three days. Whatever types of humidifiers you have, this appliance can emit minerals and microorganisms in the air. Although not all of them are harmful, they can still aggravate asthmatics. Thus, the Environmental Protection Agency (EPA) recommends the use of distilled water. How To Choose The Best Baby Swing.